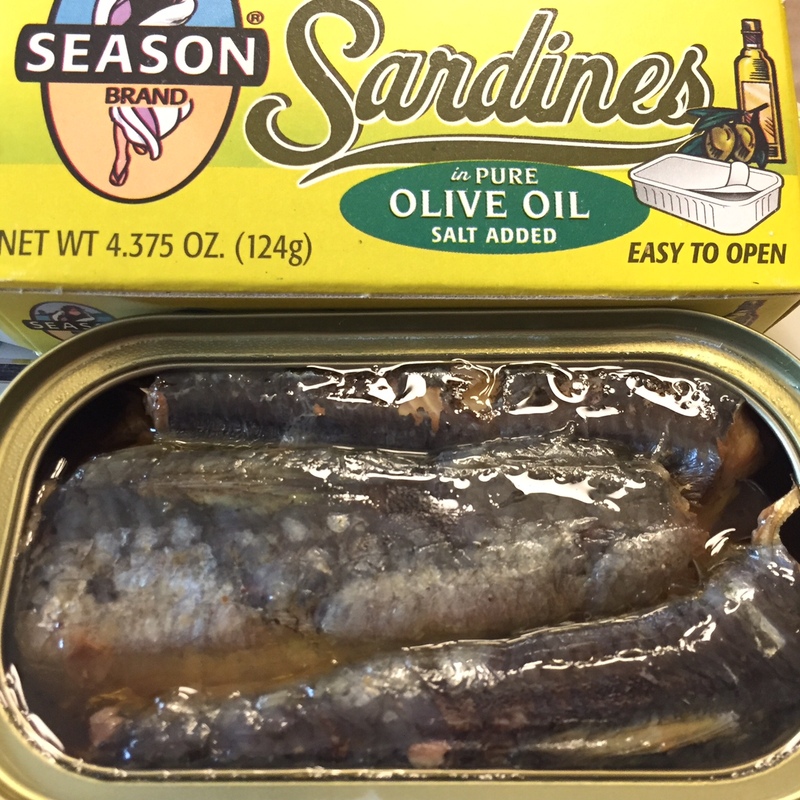 A couple of years ago when I first went on my “clean up your act to stay off meds” diet, one of the foods I identified as being particularly good for heart health was sardines. They made it into the positive foods column, alongside things like avocados, walnuts, whole grains, garlic, and a host of other foods that have been seen to lower bad cholesterol and raise good cholesterol. Sure, that’s a gross oversimplification of the literature, but the bottom line was the diet worked. One of my big regrets from that experiment was that I never found a way to incorporated canned sardines into my diet. When I was living out west, we had a good supply of fresh sardines, and I enjoyed those simply prepared over a hot wood grill several times in nicer restaurants. But the idea of canned sardines was never appealing. Maybe it has something to do with not growing up in a household that ate the food. Maybe it was about the reputation this food has for being stinky. Regardless, I was determined to give these little buggers a shot, and yesterday I finally did. There are wonderful upsides to canned sardines. They are super convenient, packed with nutrients, low on the food chain, sustainably caught, and relatively inexpensive. But none of that matters if you can’t bring yourself to eat them. Maybe it was the brand that I bought, but my first forray into canned sardines found the fish to be no more pungent than canned tuna. But perhaps that’s also because of how I ate them. This being my first can of sardines, I was neither expecting them to be so large. Nor was I expecting them to contain full skeletons. Yes, I’ve been told you can eat the soft bones, so I was unconcerned with removing every last little piece, but it was quick work to slice each fish in half and lift out the vertebrae in one or two large strips. 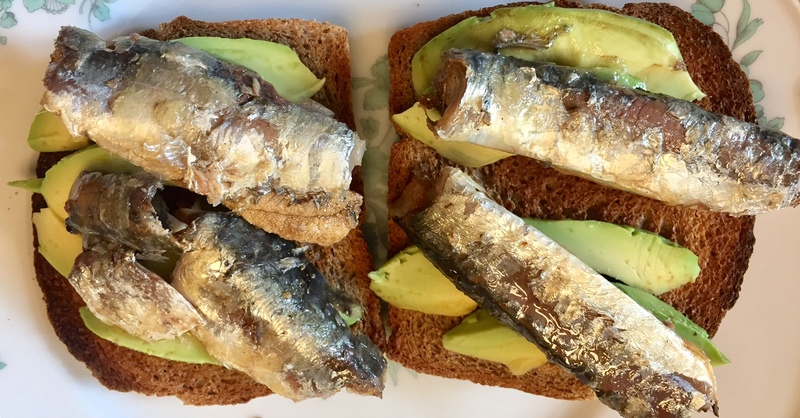 Following one of the suggestions from chowhound, I layered fillets of sardines on top of avocado toast. And they were great. The creaminess of the avocado went well with the richness of the fish. After a few bites, I did feel like adding a spicier element to the experience. Sriracha and Tabasco were both lovely for their own reasons, but in the end I preferred the zip from Tabasco the best. I have to say, those were pretty good. I’m not going to rave about just how delicious they were, because they weren’t. It was fine. This felt like a healthy, wholesome, and nutritious lunch. Now my hunch is that there are even more delicious ways to prepare sardines. Alex Fergus has a longer list of preparations than the Chowhound post. And I’ve got another can of sardines in the pantry. My goal is to try out a few different brands and see if I can find my way to a favorite. Next in line is Goya. It too has all kinds of good words on the label, so we’ll see how it compares to this first experience with the form. But I’m cautiously optimistic that I’ve found another tasty way to eat myself to heart health. Which is good, because my plan tonight is to gorge on pizza and beer. There may even be a cannoli involved. I’ve been told it’s all about balance. Clearly, I’m nailing it. Alton Brown turned me on to almost this exact recipe. Except he mashes up the sardines with sherry vinegar, parsley, salt and pepper. We’ve always got sardines in the house, either King Oscar or Trader Joes brand. I’ll be interested to see how Goya is. The Trader Joe’s version is skinless AND boneless. Only kind I will eat. Matiz Gallego Sardines with Lemon and Olive Oil. Makes a quick and tasty curry. King Oscar double layer in olive oil with skin and bones, because that’s where the good stuff is. Put some of the olive oil on your bread, put on the sardines, mashed or not, lots of lemon, thin-sliced onion and cucumber. Maybe some capers. Mouth is watering. Young grandkids and I gobble them up. I haven’t had them in a long time, but I used to enjoy the sardines packed in tomato sauce. Kind of in the same vein, have you tried the Trader Joes canned (tinned?) smoked trout. On toast with a little mayo. Daniel, Daniel . . . the secret word is BRISLING. Brisling sardines — the diminutive, delicate cousin of the behemoths in your photos — are, literally, a whole different kettle of fish. You will eat these because you want to, not because you should. Best of the bunch: Crown Prince, packed in extra-virgin olive oil. In a BPA-free can to boot! My first foray into sardines just yesterday was Tiny Tots. Yuck! Fishy smell, bitter taste, fishy after taste, fishy burps. This morning it smelled like cheap cat food when I took the lid off the container. And I could barely choke down breakfast of it on toast with arugula, pickled cucumbers/onions, sliced campari tomatoes, and sliced fresh cucumbers. If that’s been it, I’d never eat another sardine in this lifetime. But I researched, and then researched some more. Spent several hours today searching out a tin of unflavored Matiz Gallego and prepared the same way. Tuna smell, tuna taste, no after taste. One mildly fishy burp within the hour. Perfect. I’m convinced and will keep trying the tins that have multiple high rankings amongst its peers. Addendum…did a taste test Crown Prince vs King Oscar, and the King trumped the Prince unanimously. Not a huge difference but King Oscar were noticeable tastier, even to the kids. Prince does have the no bpa advantage, admittedly. Dino, the secret is LOTS of lemon juice! Sorry..above reply was meant for my previous post.